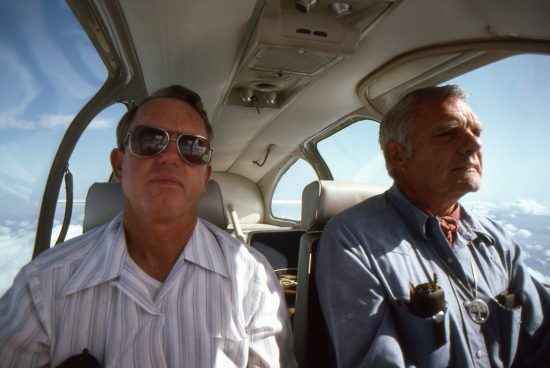 Editor’s note—One morning in the 1980s when I was working as an LA Times reporter, I hopped in an airplane with archaeologist Jay von Werlhof and pilot Harry Casey. 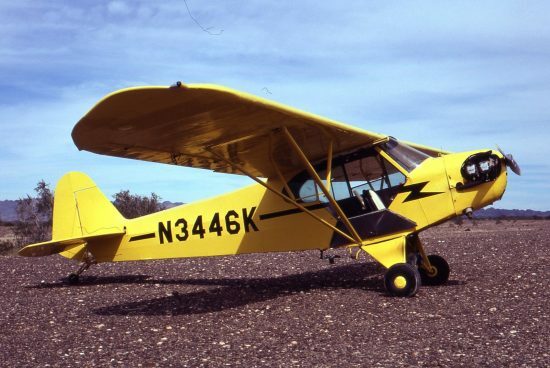 Flying out of Brawley, we cruised low over a sandy expanse in search of the original desert art. Casey, an Imperial Valley farmer, steered us over cliffs beside the Colorado River and soon we saw below us a giant human figure with his legs cut off from view, as if he was tumbling into the river. “Drag Marks” leading to a cliff overlooking the Colorado River. Sites with marks like these are believed to be where the evil giant was dragged into the river by an octopus. If you look closely at the edge of the cliff you can see a human-like figure going feet first over the edge. There are more anthropomorphic figures along the Colorado River on the California side than anywhere else (that Harry knows of) on Earth. All the anthropomorphic figures are oriented feet first towards the water. This was my first glimpse of the massive ground drawings known as intaglios, geoglyphs or The Blythe Giants. They left an impression on me, as they do on most everyone. I found myself frequently looking at the sky, and wondering about these artists who made drawings that can only be seen from the air, in a time before airplanes. 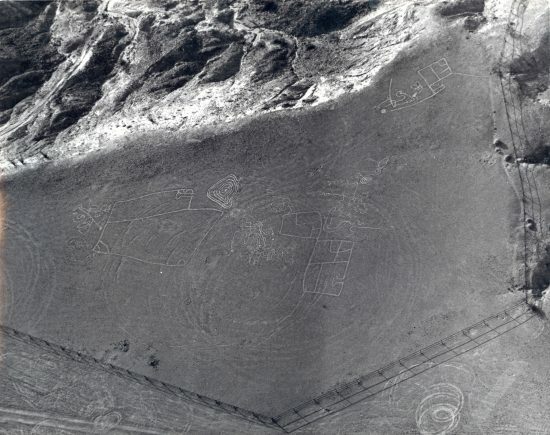 While many of us have heard of the Nazca Lines in Peru, few realize that our local desert is carved with at least 300 similar earthen figures created by early Mohave, Quechan and Kumeyaay peoples. Over nearly 40 years of exploration, Harry Casey took thousands of photographs of the Giants through a hole cut in the floor of his airplane. He is today working on a book with Anne Morgan, head curator and archivist at the Imperial Valley Desert Museum. In this Q&A, Anne Morgan discusses the book and the relationship of geoglyphs to art, as we think of it. How did you end up in the Imperial Valley? Tell us a little about your background. I’m originally from New Orleans, and grew up planning to live there forever. I went to Lake Forest College, in Illinois, and ended up getting a degree in Library Science, focusing on archives, from Simmons College in Boston. 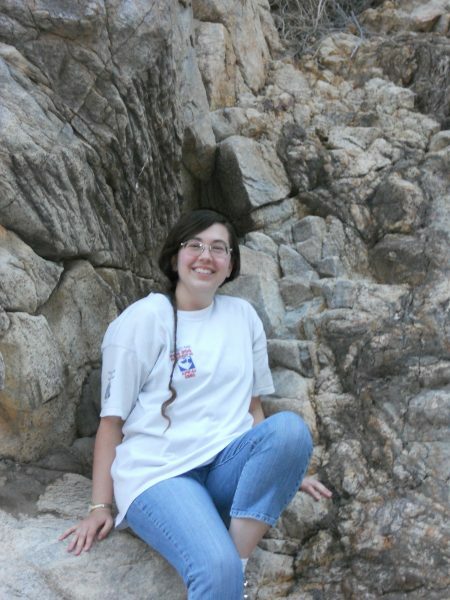 After graduating in 2012 I went to the Society of American Archivists national convention to network with professionals and maybe get some job connections. The convention was in San Diego that year and through the Simmons alumni network I met Jessica Brody. She was working in a place I’d never heard of- Imperial Valley–at a new museum called the Imperial Valley Desert Museum (IVDM). She offered me a three-month internship to develop the museum’s archives. I’d never been in a desert before and, considering how different that was from New Orleans, I didn’t really expect to like it. But it was a great opportunity careerwise and I figured I could handle anything for three months, even a desert. I got out there in September 2012 and ended up staying through 2017! I fell in love with the desert, the museum, and the amazing opportunities I found there. I went from being an archival intern to the museum’s Head Archivist and assistant Curator, to being Head Curator/Archivist, then Head Curator/Archivist and Assistant Director. When did you first meet Harry Casey or learn of the photographs? I’d heard of Harry and his photographs pretty much from the beginning of my time at the IVDM. His images are used in Jay von Werlhof’s two books: Spirits of the Earth and That They May Know and Remember, which we sold in the gift shop and I looked at to get familiar with different aspects of the history of the Imperial Valley. It was believed that a number of Harry’s pictures were already in the museum’s archives–which turned out not to be true, but it got me thinking about what an amazing story those images must tell about the desert and changes over time, and how important it would be to preserve that. I met Harry and his wife Meg for the first time at the museum’s annual membership meeting in 2012, and we clicked right from the start. 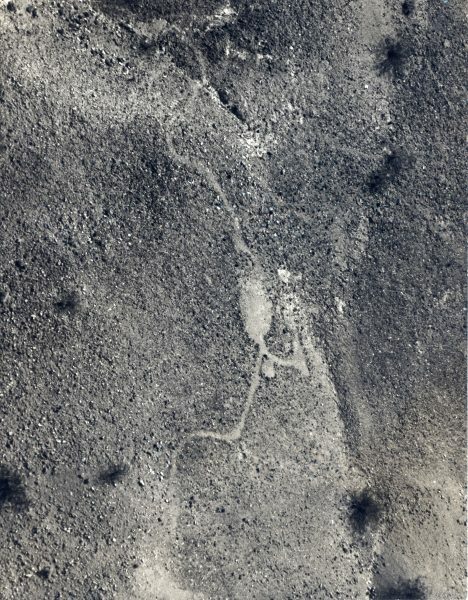 The Yuha Geoglyph site. March 1979. Imperial County, California. This geoglyph site is one of the more intricate sites and unique for the different sections within the site. It is also one of the few sites marked by the Bureau of Land Management (BLM) on their maps of the Yuha Desert, just outside of Ocotillo. Heavily damaged by motorcycles in 1975 it was restored by Jay von Werlhof and archaeology students of the Imperial Valley College based on earlier aerial images. It is now fenced by the BLM to prevent further damage by humans. The cliff edges have eroded since this picture was taken and the site is not quite as large as it was in the 70s because of this. Tell us about your first visit to the geoglyphs. The first time I saw some of the geoglyphs in person was in 2013. Steve Lucas of the Kwaaymii and longtime friend of Jay von Werlhof, who was also friends with Jessica Brody and museum director Neal Hitch, took us out on what he called “desert field trips” to make sure we saw the desert from a local Native American point of view. He took us to the “Yuha Geoglyph” which is incredibly unique. I was in awe of the view of the Yuha Desert from the geoglyph and was immediately hooked on trying to imagine the people who had been here before and who had created this site. In 2014 I visited the sites at Pilot Knob with Harry and Meg Casey. In both instances I was first struck by how the images are very much a part of the land, or maybe the land is very much a part of them. Then I was struck by how much the sites had changed from Harry’s earlier photographs. The question of whether the geoglyphs were meant to be permanent will probably never be answered, but when you’re standing there looking at the sites it opens up so many questions that you know they’ll always be with you. Jay and Harry had a remarkable friendship. Did you have a chance to meet Jay, as well? I never had the chance to meet Jay [Von Werlhof died in 2009–ed.]. I’ve heard stories about him from Harry and Meg, and from many of Jay’s former students who have visited the museum. His field classes sound like they were pretty amazing and I know Harry and Meg were friends with him and enjoyed working with him from the beginning. When you took over the task of digitizing the photos, what were the challenges? The biggest challenges definitely came from the large quantity of photographs. In the end I scanned 4,462 individual images of geoglyphs in a concentrated 230 hours. It was a big push to be able to move forward with the book project. Does Harry have the eye of an artist, an archaeologist or both? I would say both. He was always very careful to shoot images from as many angles as possible to record everything he saw and I think in just about every geoglyph site he made sure to include a person in some of his photographs (usually his wife Meg, but sometimes Jay or other members of the field class recording the site) to give a sense of size and scale. But he also got artistic with different lenses, like a fish-eye lens, or printing the images in color, black and white, and sepia to see what kind of different effects he could get or how different things might pop up in different lights and colors. 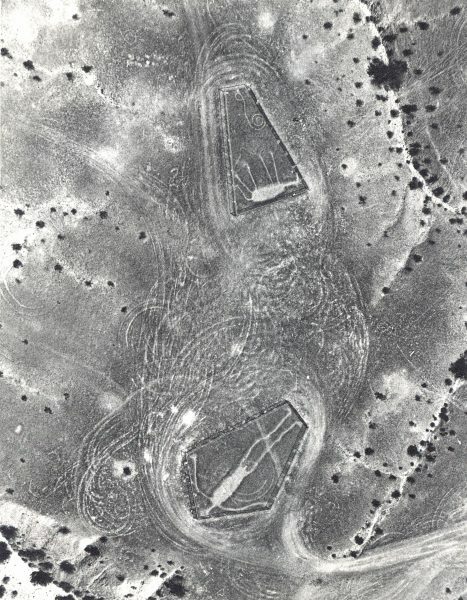 Blythe Geoglyph Complex. The area contains three anthropomorphic figures, two zoomorphic figures, and a spiral figure that may represent a snake or may represent the Colorado River. They are particularly large, with the anthropomorphic figures ranging from 92 to 176 feet tall. You call the book Earthen Art; do you regard the figures as art? Earthen Art of the Extreme Southwestern United States is Harry’s working title for the manuscript. I talked with him recently about this and we both feel that calling the geoglyphs art is both accurate and not. Were the figures created just for the sake of creation? What we would call ‘art for art’s sake’ today? Almost certainly not. At the same time, many of the figures connect to stories told in the region. Whether they are illustrations to the stories, physical representations of the stories, or something else is up for debate today. Some features, usually circular or oval patterns, are dance circles–formed more as a by-product of a dance (either social, religious, ceremonial, political, etc is unknown) than people wanting to create the circle for how it looked. So then the question really is: what is art? I look at the geoglyphs as figures that tell a people’s story, even if we may not always know the story. They are a connection between the modern world and earlier times–some of them are over 1,000 years old. Every person today may connect with the geoglyphs in different ways, have different emotional reactions to them, or be inspired by them to ask different questions. Even if that was not the creator’s intention–whether we are talking about the people who created geoglyphs or those who painted murals, made mosaics, stained glass, sculptures or different kinds of architecture–I think everything that humans do that touches others could be considered art, even if the creator didn’t think of it that way at the time. The Schneider Geoglyph. Imperial County, California. This geoglyph has been dated to nearly 3,000 years old and is the oldest of all known (and currently dated) geoglyph sites. In 2013 Anne Morgan visited this site with co-workers from the IVDM and Steve Lucas, a Kwaaymii Native American. He interpreted this site as being a representation of the Milky Way surrounded by a large dance circle that would have been used in social gatherings. What conclusions have you and Harry drawn as far as the meaning of the geoglyphs? Harry has done a lot of research and talked with many different people about the geoglyphs. Like petroglyphs and pictographs, ethnographic researchers and archaeologists all inevitably have their own theories. Harry’s are based on the ethnographic evidence in the region and often connect geoglyphs to legends that have been told for centuries. My views have certainly been heavily influenced by Harry. However we both are very much aware that there will always be open questions about their interpretation. And maybe that’s how it should be. Tell us about your working partnership with Harry. Working with Harry has been really great. When he agreed to donate his collection of photographs he wanted to talk about them with me so that I could hear his stories of taking the pictures, the field classes when some of the pictures were taken and his experiences. I wanted to hear them partly because those stories are as much a part of the collection and its history as the images themselves and partly because I was really interested. I’d drive from Ocotillo to Harry’s house in Brawley usually once a week and he’d have pulled out a new round of boxes or binders of photographs: printed images, slides, and negatives. He, his wife Meg, and I would go through every image and they would tell me what they thought of different geoglyphs, or if there was something especially memorable about that trip. By the time I met Harry he was no longer flying, but he did take me on some field trips to sites. My favorite was when we drove to the Pilot Knob area. I knew Harry’s photos of the area really well by that time and it was fascinating to compare what I was seeing with what the area had looked like up to 30 years before. It was the same way when I saw the Yuha Geoglyph site. They are so different now! Pieces are missing, faded through erosion and vehicular damage. It was also a big reminder that most of the geoglyphs–or at least certainly the large ones–were probably not meant to be seen, or at least understood, from the ground but instead from an aerial view, or from a higher hillside, to get the full effect. What are some of the images that have most captivated you? There are a couple that have really captivated me. 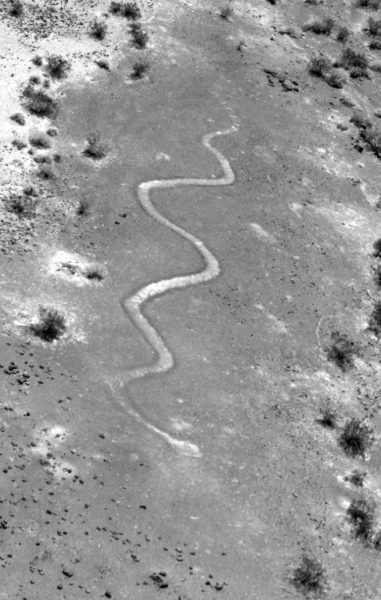 The Yuha Geoglyph site is near where I lived in Ocotillo and I’ve been to the site several times. The difference between seeing it from the ground and in aerial photographs never fails to amaze me. It’s also one of the more unique and complex sites and I see different features every time I look at Harry’s images of the site. 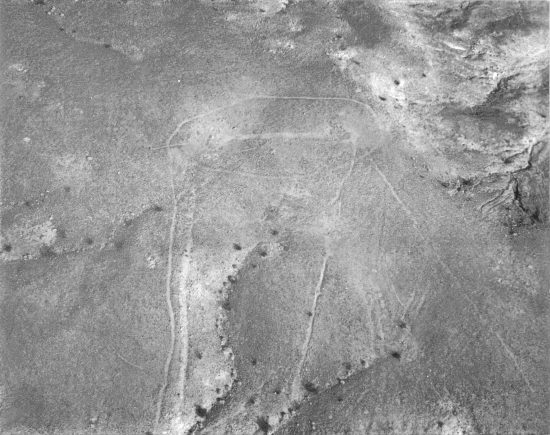 The “horse” geoglyph at Pilot Knob is also a favorite of mine, maybe because of how clearly representational of a horse it is. Horses had been extinct in the Americas for thousands of years before the Spanish came. So to me this image isn’t just a horse, it’s someone recording a life-changing event. When you think about all of the terrible things that Europeans did to Native Americans after arriving, this geoglyph always haunts me as a little sinister and a little sad: it is (to me) marking the end of one world and the beginning of another. The other geoglyph that really intrigues me is the “octopus”. The legend is that an octopus was sent by the gods to defeat an evil giant. The octopus dragged the giant into the Colorado River and there are “drag marks” and anthropomorphic geoglyphs along the Colorado River to mark not only where this happened, but also to commemorate where the octopus raised the giant out of the water on his way back to the Gulf of California to prove to the people that the giant was gone. It’s a great story, and probably one of the legends most illustrated by geoglyphs. It also immediately raises questions: How did the people living along the Colorado River in California and Arizona know about creatures like octopus? We know people traveled between the Pacific coast of California inland, and some individuals (or at least their stories) probably did make it as far as Arizona. Are there octopus in the Pacific Ocean close enough to land that someone would have seen one? Maybe one died and washed ashore? Could one have washed up from the Gulf of California? I also have a lot of fond memories of debates with my coworkers when I was digitizing the images on whether this geoglyph looks more like a squid than an octopus and what that might mean. The ‘octopus’ geoglyph. Colorado River, California. This geoglyph is believed to represent the octopus from the legends of the evil giant that may account for the majority of the anthropomorphic figures along the Colorado River on the California side. One version of the story is that the tribes asked the Sea God for help against the evil giant and the Sea God sent an octopus from the Gulf of California up the Colorado River to fight with (and eventually drown) the giant. The octopus dragged the giant into the river and went back down the river, occasionally lifting the body out of the water to show people that the giant had been defeated. What is the importance of this book? So many of the geoglyphs are now faded through both natural erosion and vehicular/human damage. You can see the differences in just the 30 years that Harry has recorded. What will these sites look like in another 30 years? Will they even be visible? Many probably won’t be. So to me, one of the important things about this book is that it is preserving a small piece of the story of the deserts of the American Southwest and the people who live here. Thirty or 50 years from now people will still be able to look at these pictures and debate what they might have meant even though the sites themselves will probably be gone–or at least not as visible as they were when Harry photographed them. To me, and hopefully to others, this book shows something that few people are aware even exist. Lots of people have heard of the Nazca Lines in Peru, but almost none have heard that we have hundreds of geoglyphs right here in the Southwest. People have been living here for thousands of years and the geoglyphs are a tangible way of not only remembering that, but of maybe connecting a little bit with them. You can’t look at them without asking questions and trying to imagine who made them, how they lived, and what they might have been thinking while creating a geoglyph or looking at it when it was new. Hopefully that will lead to more questions and more people like Jay and Harry who become passionate about discovering the stories of the land and the people who have always lived here and continue to live here. 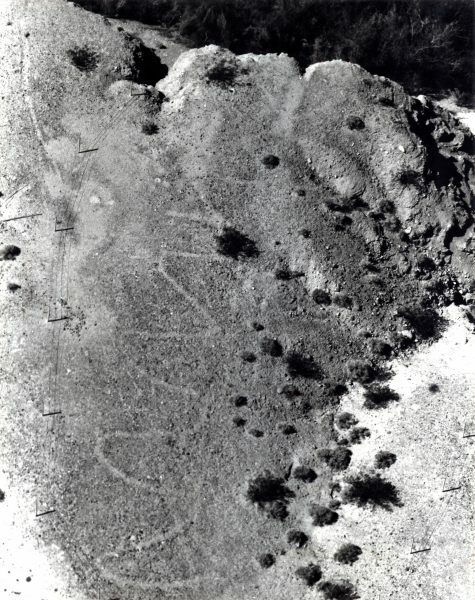 The Pilot Knob ‘Horse’ is part of the Pilot Knob site of four very different geoglyphs near the Colorado River.The picture was taken by Harry, probably in the early 1980s with a member of the IVC field class to give the 20 foot long geoglyph some scale. The horse is probably one of the most recent of the known geoglyphs as it could only have been created after the Spanish came to the area in the 1500s. I think it also is important if it speaks to people about the importance of desert conservation and protection. So many people see the desert as a big wasteland and of no importance. But the land has stories to tell us and those stories are important. Ensuring the land is kept safe and as undamaged or undeveloped as possible, making sure that people are aware of what they need to look for before building on “some empty desert space” is incredibly important. Also, neither Harry nor I are aware of too many books like this one. It is a unique opportunity to reach a large audience and interest new people in the deserts, the people who live here, and the geoglyphs themselves and we are both hoping it inspires a lot more research, both through archaeology and ethnographic studies, to try and answer some of the questions the book raises. How has working with Harry and the geoglyphs influenced your own life and thinking? I met Harry pretty soon after coming out to the desert. He has played a big part in my interest in looking beyond what is immediately visible to the eye and trying to see the big picture, the connections between the land and the people across hundred of miles. The enthusiasm Harry and Meg have for this project really grabbed me and got me hooked on geoglyphs. They encourage me to think outside the box and ask questions that I know will probably never be answered- because it’s only when you ask those questions that you find out what can be answered and what it can lead to that you never saw coming. Snake, August 1982, Colorado River, Parker, Arizona area. This 150 foot long detailed rattlesnake has changed even in the span of time Harry was photographing it. With large quartz stones for eyes, in earlier photographs while coils or ‘rattles’ are visible at the tail, the snake has no tongue. In later photos you will see a faint but definite forked tongue. thank you dear ann, wonderfully resonating’ caring about what came before us. love!!!! 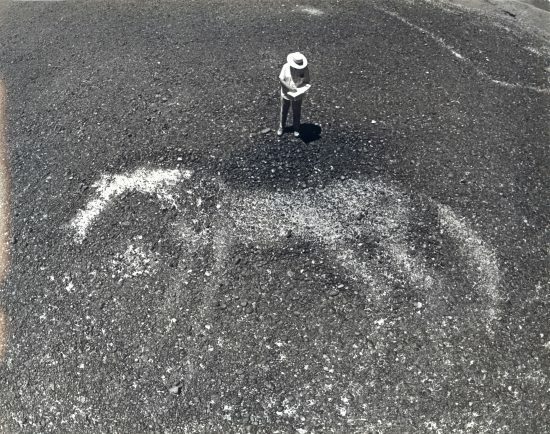 the horse geoglyph. So important to document these sites and preserve the photographs. Big thank you to all involved past and present. Wish more people knew of our “own” geoglyphs not just those in other countries. We need to respect this art and ponder it’s meaning and reason for being. There may be important messages there for us. Thank you for this article. This quote exemplified by your enthusiasm to make a difference in the Valley, plus your passion to preserve the artistic imagery recorded by Mr, Casey and Mr. Von Werlhof, reshaped my view of this “big wasteland”. It is now my great big playroom! We live in the world that those in the past shaped for us, all we need to do is share it! Thank you for doing that Anne! during their creation, and of course why? Thanks for sharing this Ann and a way to support the book. I was reading Barry Lopez’s Stone Horse and a little googling brought me here!